When in Vancouver plan to make it over to the Cambie & 41st area as I recommend a stop by Perks. Here is one of Vancouver's great pen stores. Spend some time in the store having a look at a good selection of pens, inks, paper and leather products and meet the store owner, Richard Clarke. The store has lots of character and interest. Richard has been in the pen business for some 28 or more years and you will find him an interesting fellow. Pens are in the family as the Clarke family is involved with the distribution of the Cross line of pens in Canada. When I visited the store in March 2009 Richard was looking forward to the end of the construction of the Canada Line - the extension of the rapid transit line to Richmond and the Airport. The store is on the rapid transit line from downtown Vancouver to the airport so it is easy to drop by. Our local pen club, Vancouver Pen Club, has been holding its meetings at the Perks Store on Cambie so I reguarly visit the store. Regardless how you get to the store, you will ensure your visit. It is the kind of pen store that pen users like... displays of pens along the wall, counters with pens in the middle of the store, and the layout is conducive to a feeling of exploration as you make your way further and further into the store. Richard is pretty upbeat about the future of pens and has seen a steady growth of interest in the sale of fountain pens. He carries a variety of nibs for many of the lines and there is a good selection of Private Reserve, Noodler's as well as the other major line of writing inks. He also carries a new line, OnLine and I will have to get around to trying that ink out. At the end of 2012, Mark Harcourt, South Slope Stylos, set up a location for his vintage fountain pen repair, restoration and sales in the Perks Store on Cambie. By Richard having Mark set up his work desk in the Perks store, it opens the access to Mark's skills in pen repair and restoration. Mark Harcourt at his desk in the Perks store at 5844 Cambie Street. I had Mark work on one of my OMAS fountain pens that needed the nib fixed and I Mark repair the ink feed for one of my classic Parker 75s - I was very pleased with the work he did. 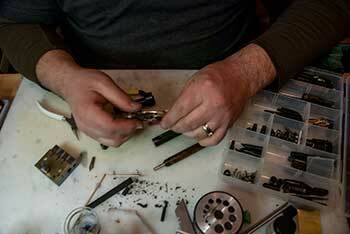 Mark has over ten years experience in working on repair and restoration work with fountain pens. His experience and services include working to end to end on the pen. That includes nib grinding and repair. 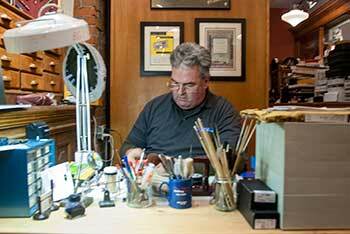 He work all lines, although he specializes with vintage Parker pens. He has built up a good inventory of parts and for those parts he does not have, he brings in to complete the required repairs. Most work is generally completed in a week, unless there are time frames to get specific parts required, and he will provide you a full quote. Give Mark a call at 604-376-5237 to make an appointment; or you can contact him via his email address: meharcourt@hotmail.com. You can also leave your pen with Richard at Perks if you in the area and Mark is not in.